Despite the final, mature decision by the couple, I was brought to tears by the essay that seemed to weigh the life of a child against his mother’s and father’s age, marital status, career plans, and politics. It struck me that, although the decision seemed to be the mother’s choice, she felt pressure to defer to the decision of the father, even against what she reports as her own growing wish to protect her baby. Until I realized that the piece was published in the “Fashion and Style” section, under “modern love,” I intended to write about the difficulty created by teaching that a child is a “choice” that can be weighed against careers and previous choices and that deliberations about that choice threatens marital unity much more than the actual changes a new baby brings with him. >Thanx. I blogged the question: Is baby as pinata an improvement over "baby as parasite"? >With all due respect, I think your criticism is a bit off-base. The article is amazingly pro-life in its message, especially for something published in the New York Times! Contrast this article with the execrable "When One Is Enough" article about Amy Richards' selective abortion….No, the article isn't perfectly pro-life. And yes, I was definitely troubled by the husband's vile attempts to pressure his wife into an abortion. But I cheered for her honest reaction to his pressure:We had spent months planning our move, and I knew David wanted it more than anything. If I insisted on having the baby and heading home, I feared he would resent me, or worse, resent our baby. But if I went through with the abortion because he wanted it, I would certainly resent him.I also cheered for the record of the Kaysens' discussion about the "options":“I don’t want to leave Mexico,” David said. “I don’t want to give up on this before we’ve tried.”“Why do we have to leave?” I said suddenly. “Why don’t we have the baby here?” It was my one olive branch, the sole place for compromise.He shook his head. “The taxis don’t even have seat belts. I’d be a wreck driving around with you pregnant.”“You already have been driving around with me pregnant.”“You won’t be able to hike through the jungle,” he said. “Or climb the pyramids.”“It’s not a disease,” I said. “It’s a pregnancy.”“Where will we live?”“We have nine months to figure it out.”“What about your career?”“People with children have careers,” I said.Bravo, Mrs. Kaysen! If only all pro-life advocates were able to argue for Life as clearly and consistently as the (probably) pro-choice Ronda Kaysen did!Finally, the conclusion is one of the most pro-life pieces of writing that I've seen in any MSM article: It’s been eight months since that day, a whirlwind of doctor visits and Spanish Lamaze classes, of resettling in Mexico City, climbing pyramids, trekking though jungles and learning to work from here while adjusting to future motherhood.Through it all, my swollen belly has been less a liability than a passport to a whole new world. I’ve found fresh conversational terrain with Mexican women. My hairdresser loves to rub my belly and feel the baby kick, and recently she showed me the scar from her Caesarean section. As I type this, our baby’s new clothes are drying on the balcony in anticipation of his imminent birth. I can’t wait to see where he’ll take us.In sort, I don't think that pro-lifers should be criticizing this article. (Except possibly to criticize Mr. Kaysen.) Quite the opposite! We should be praising Ronda Kaysen for having the strength and candor to write such an article, and we should even be praising the NYT being willing to publish it! >My criticism was the choice of the editorial department in placing the essay in the Fashion and Style section, Naaman. 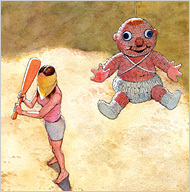 And that awful pinata picture, which seems more and more "prolife" every time I look at it. The essay is a shameful reminder of the fact that "choice" is too often anything but. Both parents made the loving, mature choice, but it was harder than it should have been, due to the culture in which they/we live.